A few weeks ago (SoTW 35) we promised a series of posts which would walk through Miles Davis’ career in the 1950s. Well, we aim to keep that promise, so here goes the second installment. In 1955 Miles Davis was 29 years old. At 18 he had begun playing second fiddle (well, trumpet actually, second lead voice to Bird’s alto sax) to Charlie Parker, the acknowledged genius and leading light of modern jazz. 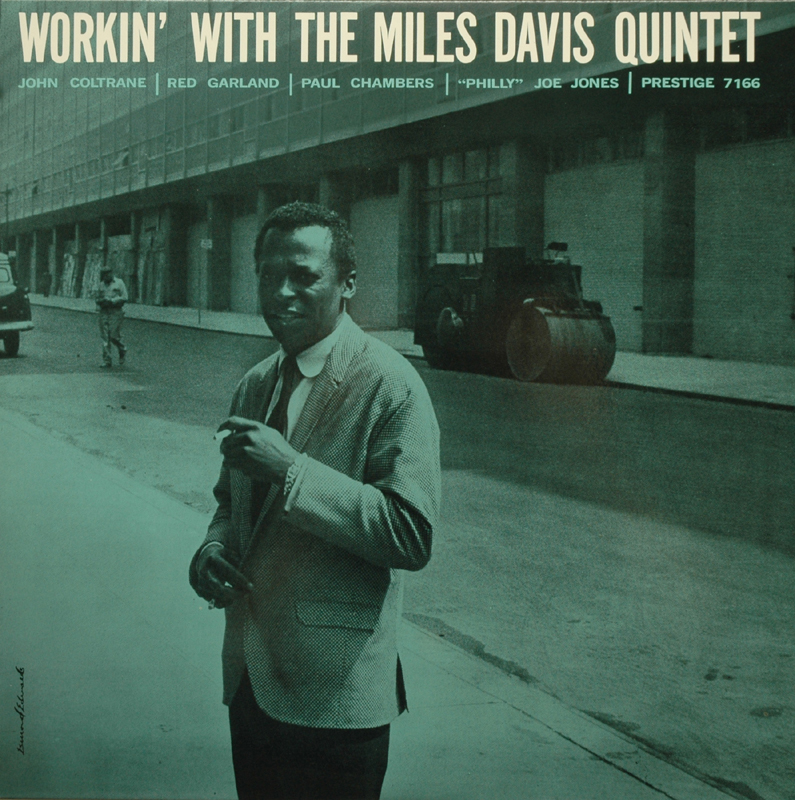 At 22, overwhelmed by Bird’s degenerate lifestyle, Miles struck out on his own and coalesced the Birth of the Cool nonet (along with Gil Evans, Gerry Mulligan and others), recording one ultra-white LP, one of the most beautiful and most influential records in all of modern music. Then in 1951, Miles – the son of a wealthy, cultured St. Louis dentist – finally succumbed to drug addiction. For several years he wallowed in heroin, recording for the Prestige label the occasional desultory session with flashes of brilliance. Then he took himself to a small apartment above the stable on his father’s horse farm, went cold turkey all by himself. Clean, he returned to New York in 1955, aged 28, an ex-star bursting with arrogant self-confidence. Jazz was having a heyday. Bird had just died (at 35). Clifford Brown and Fats Navarro were the leading trumpeters of the day (with Chet Baker beginning to make a name out in California); the Modern Jazz Quartet was playing elegant, classically-influenced jazz in concert halls wearing tuxedos; the Dave Brubeck quartet was bringing jazz to college campuses and the living rooms of respectable suburban (white) homes; the Newport Jazz Festival was serving as an annual focal point and showcase for the leading acts. 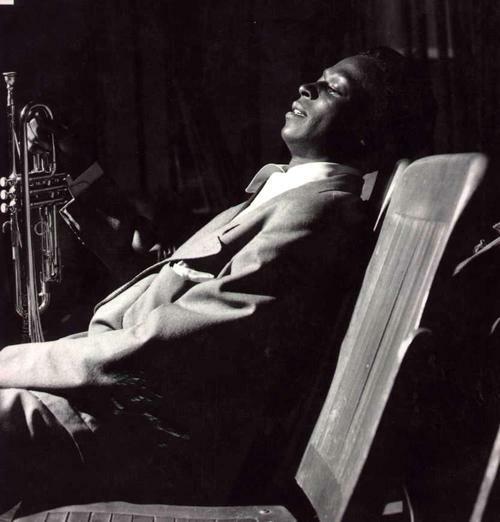 It was there that Columbia Records heard Miles, was knocked out by his great charisma, and signed him to a contract. But he had no working group, and he owed Prestige 4 records on his old contract, the money for which had long disappeared into the black holes in his veins. The standard modern jazz combo consists of two lead voices—saxophone and trumpet—backed by a rhythm section of piano (which could also serve as a melodic, lead voice), bass, and drums. So Miles gathered around him a group of upstarts (“Coleman Hawkins told me never to play with someone older than me”). One veteran, Philly Joe Jones, a wily old polyrhythmic fox, crony of Miles, a musician’s musician; Red Garland, a young Texan pianist, influenced by Ahmad Jamal’s cocktail piano repertoire and style; Paul Chambers, a 19-year old bassist; and John Coltrane, a young saxophonist from Philadelphia. All four were junkies. Coltrane’s playing was harsh, squeaky and often out-of-tune. His solos started and stopped in fits. He was technically limited, but a serious musician (he would practice endlessly), a genius in an early, chaotic stage in his development. He was widely criticized at the time as an inferior musician, but Miles stuck with him. The parallel with his own past was remarkable. In 1946, Charlie Parker was at the top of his game, but his trumpeter, Dizzie Gillespie had left him (couldn’t take Bird’s addictions). To replace him, Bird hired Miles – a young, unproven, greenhorn, with limited technique and a promise of genius that only Bird himself could detect. 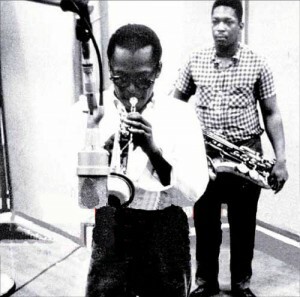 Ten years later, Miles did the same for Coltrane. Like Miles, it would be several years of addiction, coming clean, and remarkable musical growth, before Coltrane would become Coltrane. But at the time, in 1956, perhaps what attracted Miles was that the hard edge of Coltrane’s tone made his own sound that much more sensuous. And sensuous it was. 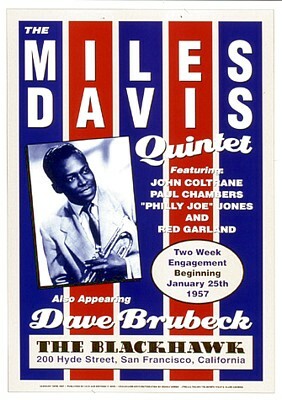 So before he could start recording for Columbia, Miles owed Prestige 4 albums. What he did was to take this new quintet for 2 marathon sessions at Rudy Van Gelder’s studio. This group is today known as ‘The First Miles Davis Quintet’. 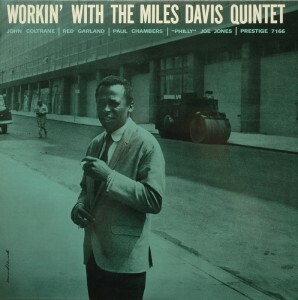 These 2 sessions were eventually packaged as 4 LPs: “Workin’/Cookin’/Steamin’/Relaxin’ with the Miles Davis Quintet”. They contain a wealth of material that is generally considered to be one of the pinnacles of modern jazz. This is time-capsule music, in the sense that if I had to play one single cut to a Martian music lover to show him what ‘jazz’ is, it would be almost any cut from this group. It’s maddeningly ‘standard’. Medium tempo, musically conservative. The repertoire is some popular tunes, some restrained blues, but mostly standards from the Great American Songbook, which we look forward to discussing some other time. Suffice it to say here that these songs are elegant, sophisticated, commercially appealing, of Jewish authorship, and most of all WHITE. Which leads one to ask why Miles Davis, a belligerent black ex-junkie would choose this material. Well, because for all his belligerent bravado, Miles (at this period at least) was playing the most poignant, melodic, romantic music imaginable. Music of a tender sweetness that has rarely been matched in the popular idiom. I think Miles was a closet Republican. He used the $4000 advance he got from Columbia on a fancy apartment on 57th Street, a white Ferrari, imported Italian suits and shoes. He was cultivating a persona as far from Bird as possible, both personally and musically. The dynamics of the group are pretty intriguing. Miles never told other players what to do. In concert, he would play his solo (often with his back to the audience), then leave the stage with no directions as to how to continue; but as his musicians attested, his presence remained on the stage. Sometimes, when one soloist was playing, he would go up to another member of the band and whisper in his ear. It was to make the soloist nervous, what was Miles saying about him? Done to keep everyone on edge. Sweet guy, that Miles. The 25 or so songs recorded in those two marathon sessions were almost all done in a single take. 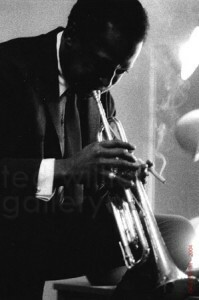 Miles felt it gave the music a creative tension, if the players knew there was no going back to correct mistakes. The song we’ve chosen here is ‘It Never Entered My Mind‘, by Rogers and Hart, originally from the 1940 musical “Higher and Higher”. (There are many, many lovely treatments of the song–here’s Johnny Hartman singing it.) Coltrane doesn’t play a single note on it, so it’s perhaps not the most representative recording from these sessions. But it’s a piece of such heartrending beauty that I figure you’ll forgive me. But do go listen to lots of these recordings. Some of my other favorites are ‘Diane‘, ‘In Your Own Sweet Way’, ‘My Funny Valentine‘, ‘The Surrey with the Fringe on Top‘. Everyone has their own favorites from these four CDs. And no one is impervious to their very special beauty. Jeff, Terrific overview of Miles Davis’s career. Interesting to understand the circumstances surrounding what I agree is stunningly beautiful music. Looking forward to reading more!